The search for the Higgs at experiments at the Large Hadron Collider was an international effort involving thousands of people, with physicists and engineers from US institutions playing a significant role throughout. In 2012, the announcement of the Higgs particle rocked the world. A scientific discovery in which thousands of US scientists participated was blasted across the globe by over a thousand TV stations to more than a billion people. TIME magazine declared it to be the particle of the year and Fabiola Gianotti, leader of one of the teams who found it, a runner-up for person of the year. Science, the flagship journal of the American Association of the Advancement of Science, named it the breakthrough of the year. This discovery was a really big deal—so big that the media and information firm Thomson Reuters has predicted that this year’s Nobel prize in physics will go to two scientists who predicted the Higgs boson’s existence back in the 1960s. The data used to make this discovery was recorded at the Large Hadron Collider. Although the LHC is located at CERN in Europe, the discovery was an international one. Scientists from across the globe were involved in all stages of this discovery. More than 6000 researchers from institutions in more than 60 countries are currently participating in the LHC experiments. Nearly 2000 physicists from the United States contributed to this effort; the United States provides more researchers than any other country. These scientists came from 96 US universities and research facilities in 33 states, plus Puerto Rico. Like all LHC collaborators, institutions in the United States built equipment at their home facilities and shipped them to CERN. American scientists also helped operate the experiments and played a major role in analyzing the data that led to the discovery of the Higgs boson. There are examples where US scientists have had a key impact. For instance, Joe Incandela, a professor of physics at the University of California, Santa Barbara, was in the international spotlight on July 4, 2012, when he announced the discovery of the new particle, as leader of a team of more than 3000 scientists on the CMS experiment. The two detectors that independently discovered the Higgs particle, ATLAS and CMS, can be thought of as huge digital cameras, each one larger than a five-story building and weighing many thousands of tons. And they are no ordinary cameras. They have 100 million pixels each and can take 40 million pictures every second. By sifting through these pictures, scientists are able to better understand how the universe works. Fully a third of the cost of building and operating these detectors is borne by the United States. Together, the US Department of Energy and the National Science Foundation contributed about $165 million to the construction of each device. These two agencies have a long history of funding fundamental research, resulting in technical payoffs including such innovations as medical imaging and cancer treatment, materials science and high-performance computing. While the United States has supplied about 30 percent of the budget and manpower necessary to operate the LHC experiments, this number probably underestimates the impact of US scientists on the LHC research program. 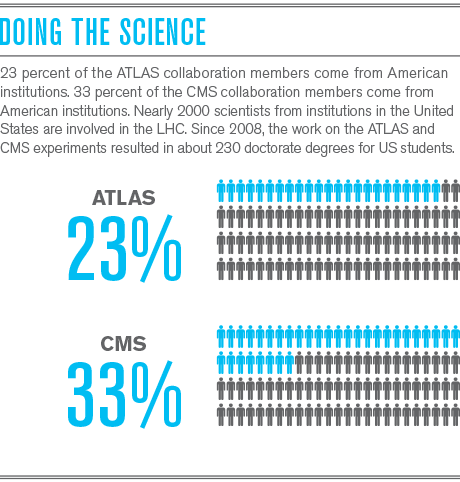 Brookhaven National Laboratory provides the second largest group of physicists working on the ATLAS experiment, eclipsed only by CERN itself. The situation is similar in CMS, where Fermi National Accelerator Laboratory is the second biggest research group. Hundreds of American graduate students have written their PhD theses on research tied to the LHC experiments and have moved on into the American technical workforce. America’s strong commitment to fundamental research ensures that US physicists will continue to play a central role in mankind’s millennia-long efforts to understand our universe.